The Class of 2019 has some good point guards and you can throw Shavir Wheeler's name in the bag. 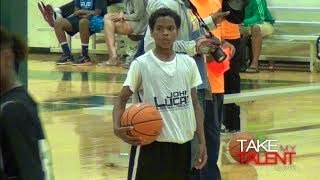 The 5’1 point guard from Houston, TX put on a show at John Lucas Camp and finished ranked #11 overall. His flashy handle is something to watch but he also adds a superb court vision and unique feel for the game. He had defenders wishing they saw the trainer to get their ankles taped before stepping on the floor against him.